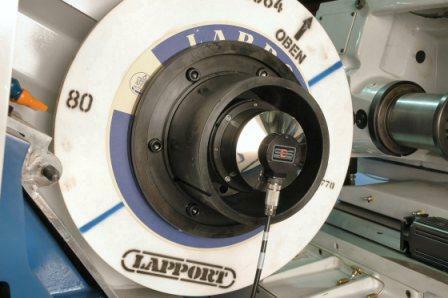 Comprising a computer control, sensor, spindle mounting adapter and balance head, the SBS external balancer system is designed as an inexpensive, permanent attachment to any grinding machine. The SBS system is fully automatic in operation - eliminating the need for static pre-balancing - and is suitable for grinding wheels up to 48 inch diameter. It will interface with CNC machine controllers and can be incorporated into any QC/SPC programs designed for grinding operations. The system can be supplied both as a retrofit package or as an original equipment option on many machines. See the productivity, quality and cost saving benefits for yourself through our 14-day free trail offer. Features a bright graphic display in a sealed enclosure for the harshest of grinding environments. 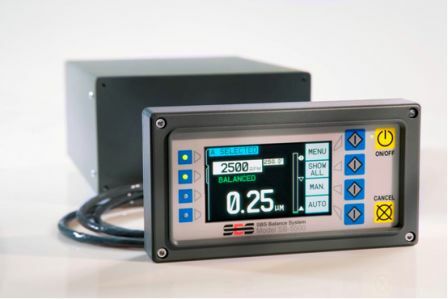 The compact sensor unit monitors vibration levels with high accuracy. It can be mounted to the machine using the magnet supplied or by mechanical fasteners. The balance head incorporates two eccentric weights, which are adjusted to automatically compensate for wheel unbalance. Balance is maintained even if the wheel is stopped and re-started. A wide range of adapters are available for mounting the balance head quickly and easily to all industry-standard grinding machines.